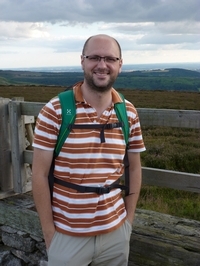 My name’s Phil Jardine, and I’ve recently joined the Palaeoenvironmental Change Research Group as a post-doc, on the NERC-funded ‘500,000 years of solar irradiance, climate and vegetation changes’. For this project I’ll be analysing the chemistry of pollen grains from a 500,000 year long sediment record from Lake Bosumtwi in Ghana, with the aim of generating a long-term historical record of solar irradiance. Before coming to the Open University I was based at the University of Birmingham, where I did PhD and post-doc research on North American pollen records from the early Palaeogene (~65 – 45 million years ago). For this work I was particularly interested in the role of climate in driving changes in plant communities, especially during a rapid global warming event 55 million years called the Paleocene-Eocene Thermal Maximum (PETM). Having worked for some time now on pretty old material, I’m looking forward to researching something a bit more recent – if you can call the last 500,000 years recent – and going out to Ghana and looking at real, live, tropical plants. If you would like to get in touch about the Lake Bosumtwi project, or something else pollen related, please feel free to get in touch.